Where were you on September 11, 2004? That was when last a non-Porsche won a round of the German endurance Championship; Hermann Tilke / Dirk Adorf / Ulrich Galladé were successful in the 2004 edition of the 6 hour race with their Raeder V8STAR “Jaguar”. At the same race two years later, Tilke, Adorf and Peter Oberndorfer did not see the finish in their Raeder-prepared Lamborghini Gallardo, but another team ended Porsche’s two year winning streak. 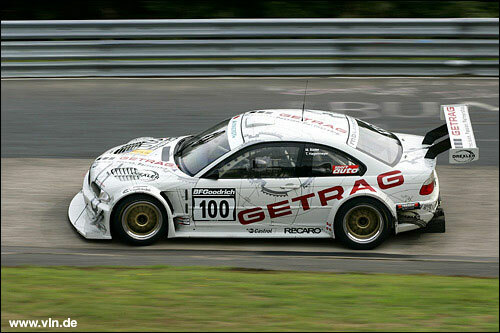 Aided by touring car racer Markus Gedlich in the longest race of the German championship season, stalwart VLN racers Michael Bäder and Tobias Hagenmeyer in their #100 Getrag BMW M3 GTR took their first overall victory in over a decade of competition on the Nordschleife. Their progress to the head of the field was aided by some bad luck - in fact, a whole lot of it - that befell the three leading Porsche teams, almost simultaneously: the Jürgen Alzen Motorsport 997, the Land Motorsport 996 GT3-RSR, and the Manthey Racing 996 GT3 all found the same patch of fluid on the track at Flugplatz on lap 2, and ended their race there and then with spins into the barrier. Luckily, no drivers were injured; this development then handed the Getrag BMW crew control of the race, and they grabbed the most of the situation with a steady performance for the remaining 38 laps. If the Adam Opel trophy went to a BMW team, an Opel at least got to the runner-up spot. 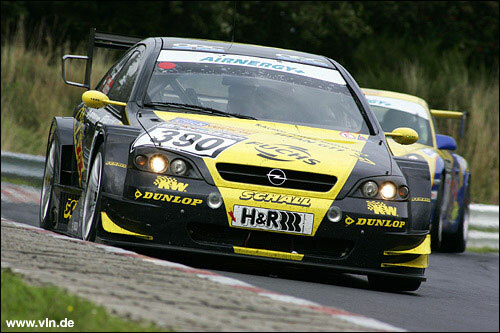 For the second time in a row, Andreas and Ralf Schall managed a second place in their ex-DTM Opel Astra V8 coupe, some 6:38 behind the winners. 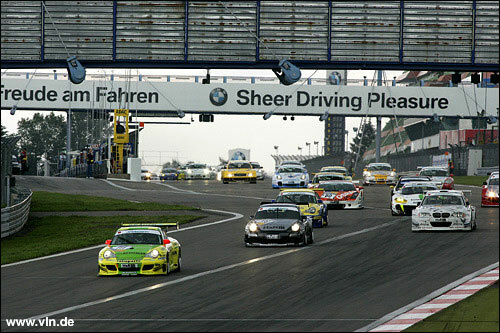 And Sabine Schmitz / Klaus Abbelen secured a podium finish for the Porsche marque with their 997. Still no change at the head of the points table: with an eighth place overall, and another commanding performance in the under-2000cc diesel class, Schubert BMW drivers Claudia Hürtgen and Marc Hennerici are beginning to look like a very safe bet for the 2006 title. Formerly in the ALMS with the KnightHawk MG/Lola, Hürtgen currently also acts as development driver for BMW’s much-delayed Z4 M coupe customer project, while Hennerici won the privateer class of the 2005 World Touring Car Championship in 2005. Nothing is decided yet: they have a scant .94 advantage in the points standings, so one slip-up is all it takes to end their title hopes. And as the 6 hour race showed, slip-ups are always likely to happen when they are least expected. Three more races remain in the German championship, the next another 4 hour affair on September 30.